As recently as the early 1990s, the old adage, "See Naples and Die"—meaning, of course, that after the beauties of Naples, only Heaven, itself, might have something to offer—was often cynically twisted on the tongues of Neapolitan wags to "See Naples Before it Dies" and—ominously—"See Naples and Get Killed". Now, amidst all the talk of a Neapolitan renaissance, the skeptics are still around, to be sure. They are quick to warn you against bandying about phrases such as "renaissance" too freely. Remember, they say, that even the version with the capital "R," while boasting Leonardo and Michelangelo, also had lots of corruption, murder, intrigue, and pestilence —not unlike modern–day Naples, they say. Yet, in Naples, today, even the skeptics are sitting up and taking notice. Things may be changing. Maybe. Change in Naples has always meant building—tearing down the old to put up the new. From the great passenger terminal at the port of Naples to the main post-office, the city is still marked, for example, by the gleaming façades of monolithic Fascist architecture of the 1920s and 30s. The buildings were a cosmetic fix and now serve as reminders of the giant egos of ideology and sit there like white elephants dozing in the sun. 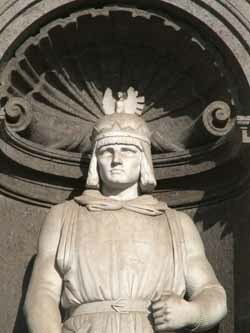 Then, back in the early 1800s, Napoleon set up his brother-in-law, Murat, as king of Naples. Murat built entire new portions of the city, including a Pantheon–like temple to Napoleon (now the Church of San Francesco di Paola, seen in the photo, above) across from the Royal Palace. Before that: the grand-daddy of all urban renewal projects, the Spanish remake of the city in the 1500 and 1600s, including the so-called "Spanish Quarter," one of the first examples in Europe of square blocks of four and five-story apartment buildings. None of this, however, can be said to have worked—at least in the sense of truly dealing with what ails Naples. First of all, the Naples that generations of tourists have avoided for years is still very much there. The city is a microcosm of all the social ills that any big city could possibly be heir to. Petty theft is rampant, and organized crime is tenaciously entrenched. The unemployment rate among working–age males is said to run as high as 40% (! ), and the city's two main universities are homes for aging history and literature majors in no hurry to finish school and swell the ranks of the jobless. Also, thousands of illegal immigrants from Africa now strain the city's already overburdened social services as they sneak into the city to find no jobs except peddling knock–off leather bags, baseball caps, and bootleg CDs on the street or offering to wash your windshield at stop-lights. Or, if they are women, they may wind up with underpaid and undeclared jobs as an au pair—or, worse, join the ranks of the African prostitutes who line the ancient via Domiziana as it winds north out of the city. These unfortunate souls join the ranks of native underclass—not merely unemployed, but perhaps unemployable, one of the few bodies of lumpenproletariat left in Europe, people with no skills to sell. What then has changed? Well, for starters, another wave of construction is rolling in. There is a new Civic Center going up on the east end of Naples. It is a sparkling boom-town of steel-and-glass office buildings and condos surrounded by spacious pedestrian malls and equipped with restaurants, shops, and underground parking. Eventually, the complex is meant to house all the municipal office space for the Naples of the future as well as provide substantial living space for thousands. It was also to be the home of NATO's new headquarters for the Allied Forces Southern Europe (AFSOUTH). That plan has been scrapped for various reasons, not the least of which is that this sparking satellite city is in the worst part of town right next to the huge prison, Poggioreale. The current occupancy of the finished office-space and apartments is still low. Public transport is improving, too. New busses—some of them the extra-long version with that accordion bend in the middle—cautiously cruise the streets as wary drivers try to maneuver all those extra new feet of bus safely around—not over—corners and feet. And, in a city that has raised the fender-bender to high art, the busses still look pretty good. Even the new subway, the metropolitana, mentioned above, is inching its way towards completion. With the most difficult part (on the Vomero hill above the city) finished, the new stations down at sea-level are in various stages of completion. Most problems now seem to be cultural rather than anything else; that is, for example, the digging if front of the old Angevin Fortress has uncovered the 16th century fortifications of the fortress, and decisions have to be made about what to leave and what to destroy. Similarly, excavations at Piazza Dante and on the main road, Corso Umberto, to the central train station, have uncovered bits and pieces of the original Greco-Roman city. Here, archaeologists and engineers have to come to a meeting of the minds—not always an easy thing to do. Safety from crime in the city—the common lament of tourists and natives, alike—is better because of a sledgehammer approach that is at least holding its own. The streets are crawling with police, augmented on occasion by flak–jacketed members of the regular Italian Army who patrol the streets and are positioned in front of public buildings and banks. In early June 2003, six of those floating mother-ships of tourists were in the port of Naples at the same time. They disgorged 8,000 passengers into the heart of Naples. No doubt, a few had their pockets picked or purses snatched or bought a genuine "Rolleks" or got otherwise scammed. I doubt if any one of them was assaulted physically. They sailed into an armed camp and probably felt safer for it. At least on the surface, the "renaissance," then, is working. Tourism is thriving in Naples. Millions of visitors no longer just jump off to go somewhere else. They hang around to enjoy a coffee or meal at a sidewalk restaurant, or to visit one of the city's dozen or so museums, from the overwhelmingly complete National Archeological Museum to the recently opened National Railway Museum, which houses Italy's first steam locomotives. Visitors go underground to explore the original Roman aqueduct system, or to view the most extensive paleo-Christian catacombs in Italy south of Rome, or to visit the recently opened site beneath the Church of San Lorenzo where the main crossroads of the original Greek city have been laid bare. The city's main youth hostel, once a very lonely place to spend a night, is jammed with backpacking kids from around the world. In short, Naples is open and enjoyable. Beneath the surface, however, the skeptics remind us that there are questions that have no easy answer. When Naples was the capital of its own Kingdom of Naples—the entire southern half of the Italian peninsula plus the island of Sicily—the economy of the city quite naturally centered on the bureaucracies of running that kingdom. Those mechanisms became redundant when Italy was unified in 1860. Since then, they have had great difficulty adapting to running what is, essentially, just another very large Italian city with middle–class aspirations and a would-be industrial base. Unlike smaller cities, such as Venice and Florence, that can, and do, live very well from tourism, there is no way that Naples, hub of the most densely populated urban area in Europe is going to convert to one giant service industry for tourism. That is simply not going to happen. Also, Italy's highly-touted "clean hands" campaign, an anti-corruption and anti-crime program begun in 1992, continues to sputter along as it attempts to deal with the Camorra—the Neapolitan Mafia—which has its finger in most of the economic pies in Naples. The most recent flat tire on the wheel of Italian justice is a revision of law 513 that covered testimony given by so-called pentiti (from "to be pentitent," thus, "those who are sorry"). These are ex-Mafiosi turned "stoolies" who give state's evidence in exchange for money and a place in a witness protection program. In the past, their testimony, given in private to the Italian State Prosecutor's Office, has been valid evidence in subsequent trials against the Mafia. Now, however, they must appear in a public trial and repeat their testimony openly and before those who are on trial. Their former colleagues in crime have let it be known that "those who are sorry" will be even sorrier if they re-testify. The papers are already speaking of a number of pentiti pentiti [sic]— "those who are sorry they were sorry." This is discouraging to law-abiding Neapolitans, who live in a region of Italy where there are 200 gangland murders a year. Neapolitans see one ex-Prime Minister, Bettino Craxi, who was—until his recent death—in well-heeled hiding in Tunesia, fighting extradition back to Italy on charges of corruption; and they see, and are generally skeptical of, ex-PM Giulio Andreotti's recental acquittal for alleged Mafia links. Thus, any relaxation of the war on crime does nothing to foster trust in the government. This degree of economic anarchy creates, paradoxically, a look of opulence in a city where so many people say they have no money. Everyone seems to be hustling something, and a normal weekday along via dei Mille, a fashionable shopping thoroughfare, looks like Christmas on New York's Fifth Avenue. People think nothing of dropping 150 dollars for a pair of shoes or 200 for a sweater. And in a city that still has post-WWII rent-controls in much of the downtown area—meaning you can still pay as little as one-hundred dollars a month—if you want to buy a flat overlooking the bay, it can cost a cool Manhattanish one-million dollars. So, if the renaissance of Naples has breathed some new life into the city—and it has—Enrico di Gennaro, 53, can be pardoned for his skepticism. He is a street-sweeper who now leans on his long-handled whisk broom as he glumly watches the latest wrinkle in renaissance come putting down the street. It is a newfangled—for Naples—automatic street-sweeper with the apt name, "Cleango," brightly emblazoned on the chassis. It purrs easily in and out of the few cars left at curbside in August along the Corso Vittorio Emanuele. The whirring circular brush whisks away the meager litter of a city almost deserted by its vacationing inhabitants. "Hah!" says Enrico. "Look at the stuff he's missing. What's that machine going to do when people get back from holidays in a few weeks and there are cars double-parked all over the place? This is the steadiest job I've ever had, and now they want that, too." He grumbles over and sweeps up after Mr. Cleango. Enrico wonders just how much of the renaissance is going to trickle down. OK, maybe this one wasn't illegal, but it should have been. It sits on the Vomero hill overlooking the bay and is called the "Great Wall of China" by locals. UOSAE is the acronym for Unità operativa speciale antiabusivismo, the special police unit that combats illegal building. Such construction includes items such as an extra balcony put on a house, an entire floor added to the top of a building, an entire house, and even, in some cases, a gigantic luxury hotel on some bucolic coastline that was supposed to be protected from the encroachment of “wild cement,” as the Italian term has it. The police unit has a tough job. Their successes are spectacular, as in the case of the recent demolition of a hotel along the Amalfi coast. UOSAE reports, however, that in the summer of 2003 there were twice as many cases of illegal construction (300) in Naples than just a year earlier. Of more concern than just the numbers is the kind of building undertaken without a permit. Most cases used to involve the clandestine garage or maybe an additional balcony out back and away from the street. Now, entire houses are going up, and they are not always that easy to spot. Much of the land considered ideal for a house or villa is along the Posillipo coast and hill or on the Camaldoli hill in back of the city, territory that is still off the beaten track and hidden away from public view. The city of Naples already employs squads of volunteers to walk around and report back on what they find. The city now plans to employ satellite technology—high–resolution spies in the sky to spot offenders. The problem is obviously not limited to the city of Naples. Quite the contrary. Those with the money to do so might choose to build way out in some God–and copforsaken, serene bit of wilderness. Who wouldn’t want to live amidst the natural splendor of the Cilento and Vallo di Diano national park, for example? Stopping “wild cement” from spilling into that marvelous area is a new concern, as the newspaper reports today. It certainly isn’t a new problem. You can stand and look at Corso Umberto, the street that was the centerpiece of the risanamento—the decades–long splurge of urban renewal in Naples at the turn of the 20th century (see next entry)—and notice something odd. Almost every one of those buildings along the entire mile of avenue on both sides of the street has an added floor. What started out as a four-story building turned into a five-story building in the years that followed. Some of it was done after WW1 and some after WW2. Some of the added stories were done well and are not easily distinguishable from those of the original building. A few are sloppy and stand out. I can’t believe they were all built legally. Another problem is the legal item called a condono—amnesty, pardon. After the earthquake of 1980, there was such a rush to make sure that people had places to live that the city legally forgave an awful lot of unnecessary and illegal construction. That legal machinery is still in place, resulting in the existence of skeleton buildings in various places in the city, structures that were left half-finished, but which cannot be demolished because the legal battle over a condono is still going on. By 1904, the date of this partial map of the port area of Naples, all of the shaded areas represent new streets and buildings already in place as part of the Risanamento. On January 15, 1885, the Italian legislature passed the Legge per il Risanamento di Napoli—the Law for the "Cleaning Up" of Naples. Here, risanamento means, literally, to "make healthy again." It was a law passed after more than a decade of thought given to the problem by urban planners, both local and national. The solution was to be of the so-called 'Haussmann' type, referring to the urban planner who had bull-dozed many of the slums of Paris a few years earlier in order to make room for the future. It was in keeping with other projects around the world at about the same time, plans that saw urban surgery as the only way to save the patient: go in and cut out the infected parts of the city. In many places, including Naples, this meant razing entire quarters of the city. First came the difficult expropriation process—clearing people off their property; then demolition; and, finally, reconstruction. Neapolitans referred to the process as sventramento—literally, "gutting." In order to understand what the risanamento accomplished—or failed to accomplish—one has to understand the problems that faced the city at the time. Annexation of the Kingdom of Naples to the rest of Italy in 1860 (see Garibaldi) brought severe problems to the city of Naples. For centuries, the city had existed as the capital of a nation; it had been that nation's social, cultural and administrative hub. Naples, at the time of unification, was the largest center of services and administration in Italy. There is some justification for bureaucracy when it has something to do—and, indeed, Naples had a kingdom to take care of. However, when there is suddenly nothing left to run, society becomes much worse than just top-heavy with bureaucrats—it borders on collapse, or at least severe decay. Naples was in that difficult position after the unification: it was an ex-capital with nothing to do. In order to assume some sort of a normal role as just another large Italian city, it would have needed an industrial and commercial base—it had none, or at least none that could compete effectively within a united Italy. It would also need an able administrative class on a regional level; yet, the ex-administrators of the Kingdom of Naples showed themselves particularly clumsy in making the transition. Additionally, Naples was beset by the inability, or unwillingness, on the part of its new boss, the central Italian government, to deal with the problems of the South. For a few years after unification, Naples seemed to move ahead simply on bureaucratic inertia. There were, after all, a number of municipal projects left over from the Bourbons which could and should still be finished. Thus, via Duomo was completed and opened to join the city center with the port; the splendid corso Maria Teresa (today corso Vittorio Emanuele) was finished to become one of the city's main east-west roads, winding along above the city, halfway up the slope of the Vomero hill; the Villa Comunale—the former Royal Garden—was expanded. There are many other smaller projects, as well, which were carried out in the first twenty years after unification. In a lighter vein, even the cable-car up the slopes of Mount Vesuvius was opened in 1880, giving us all the happy little tune, Funiculì, Funiculà, composed especially for the occasion. Yet, as Alfonso Scirocco points out in Storia di Napoli : "The good will of local civil servants simply wasn't enough to do the job." Here, "the job" meant a number of huge problems left outstanding when the Kingdom came to an end, but problems that the Bourbon rulers had long known they would have to be deal with if Naples was to prepare for the future. These problems now belonged to the new federal government. Among these were: the expansion of the port of Naples; the creation of new industry in what was essentially an agrarian society; the creation of new residential areas, chiefly in the areas of Posillipo and on the Vomero hill above the city; a transit system; and new roads to connect the main railway station to the rest of the city as well as to facilitate expansion to the east and west. A formidable list. 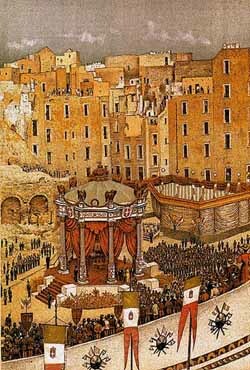 Inauguration of the Risanamento from Raffaele D'Ambra, Napoli Antica 1889. The results of the risanamento are evident today. The broad boulevard named Corso Umberto—called by Neapolitans simply the rettifilo, the "straight line"—the road that passes through the downtown area from Piazza della Borsa to the train station is the most striking product of the risanamento. It was achieved by clearing a wide, mile-long swath through the middle of town. It got the job done, clearing the center of the city of terrible slums and improving transit through the city along the new route. On both sides of this broad boulevard, dozens and dozens of architectural children of the risanamento were born: new offices, shops and residences in high spacious buildings. Among these were the neoclassical main building of the University of Naples and the imaginative configuration of four identical buildings—called "the quadruplets" by Neapolitans—occupying the four corners of Piazza Nicola Amore. 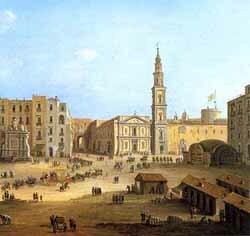 At the end of the rettifilo, the spacious Piazza Garibaldi was created and surrounded by new buildings. The entire section of Mergellina was transformed, as well, including the addition of the new via Caracciolo, the spectacular seaside road reclaimed from the sea in front of the Villa Comunale. Additionally, the infamous bassi of Naples, vile cellar dwellings in the most densely populated areas of town—nests of disease—were cleaned up. Modern-day Naples is unimaginable without those changes wrought a century ago. From that point of view, then, the worst criticism of the risanamento—that it was a gigantic public works boondoggle—is unjustifiably harsh. The other day on TV, the RAI—the Italian state radio and television agency—presented the first in a series looking back at 50 years of television broadcasting in Italy. 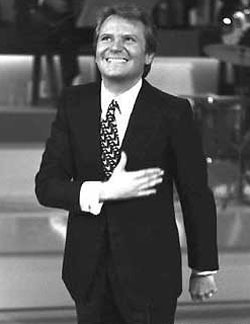 One of the most poignant moments was the portion dedicated to the work of Alighiero Noschese, the Neapolitan who might have remained just another actor/comic in a profession awash with actors and comics had it not been for his uncanny ability to imitate others. I can't substantiate the anecdotes from his schooldays here in Naples—for example, on the phone, "Hello, I can't come to school today. I am ill. This is my daddy speaking. "—but it wouldn't surprise me. A woman I know who remembers Noschese as a high school student in Naples says that he didn't stand out: he was courteous and easy to get along with, but not the life of the party, not the person who just naturally seems born to entertain and delight others—"anonymous" was the word she used. That described him as an adult on the few occasions you got to see him as himself and not in one of his comic sketches. Who knows if that description was not at the heart of his ultimate tragedy? He was born in Naples in 1932. By the late 1960s and all during the 70s, Noschese pretty much owned the field of imitating. It was one that he might be said to have invented, at least for Italians. Before Noschese, it was not at all common to watch comics get up and make fun of well-known persons in public life. After Noschese, it was commonplace, as any young comic/mimic in Italy will tell you. One of them said, in tribute to Noschese, that "it was embarrassing to see someone with so much talent." Perhaps his secret was that he didn't make fun of so much as have fun with the people he imitated. I can't imagine any of the prime ministers of Italy, the heads of political parties, other actors, news commentators—anyone at all—ever being offended. I saw him once live on stage when he imitated Pope Paul VI. It wasn't in the least offensive, and I'm sure the Pope would have loved it. Noschese "did" all the prime ministers and politicians in Italy to perfection; as well, his version of the great director Fellini was hilarious, as was his imitation of the poet Giuseppe Ungaretti, whose excited, incoherent readings of his own poetry on TV were funny enough in their own right. Noschese did voices and body mannerisms to perfection and then spent hours on make-up to wind up looking as much as possible like his target. Noschese took his own life in 1979. He was being treated for depression, and I have heard that he was found dead in front of a statue of the Virgin Mary. His suicide sent a wave of incomprehension through Italy—the funny guy, the great mimic, why would he kill himself? Amateur analysts speculate that his life was so devoted to imitating others that he had no sense of self. Who knows. I would have thought that a city so devoted to its Patron Saint would have his birthplace—at least the site traditionally regarded as such—marked in some way other than with a simple plaque in a rundown building. "Rundown" is probably not fair, since that condition is hard to combat in a section of town where all the buildings are from the 1400s and 1500s. There is only so much money to spend on religious and cultural relics, and what there is normally goes into keeping the larger well-known sites in shape: the Duomo, the church of Santa Chiara, etc. Within, then, the courtyard of a—let's say "old and non–descript"— building, precisely, via San Gregorio Armeno 41, just off the corner of via San Biaggio dei Librai (see the map of the historic center of Naples—the house is adjacent to number 27 on the map), there is a plaque (photo, above) identifying the site as the home of the family of San Gennaro (St. Januarius) and the birthplace of the saint. The building is appropriately called Domus Januaria. The plaque was put in place in 1949. The entire area is in the heart of—better, over the heart of (since that part of Roman Naples was buried in a mudslide in the sixth century a.d.)—the historic center of Naples, and, indeed, is only about 70 yards downhill from the entrance to the excavated Roman market place that now lies beneath the church of San Lorenzo. If you could dig straight down within the courtyard of via San Gregorio Armeno 41—or any other building in that area—you would run into the buildings that were next–door neighbors of the Roman market place in the days of San Gennaro, who was martyred in 304 a.d.
Eleonora was an unlikely revolutionary. She was born in Rome in 1751 of Portuguese nobility and would be hanged in Piazza Mercato in Naples in 1799 in a grotesque caricature of an execution. Her executioner, Maria Caroline of Habsburg, Queen of Naples during the Neapolitan Revolution was also born in 1751. That was also the decade of the great Lisbon earthquake, about which an anonymous poet wrote lines as if describing the dramatic events that would soon shake Europe the way the earth had shaken Portugal. In the 1770s, Eleonora became an important part of literary circles of the day. She joined discussions of literature, politics and science. She wrote poetry and carried on the type of correspondence so popular among intellectuals of that period, the kind destined to wind up in some distant future anthologized as "The Collected Letters of...". These groups, themselves, were in imitation of the French salon of the day, as was the participation of women. It was the beginning of the age of the liberation of women—education, participation and, eventually, suffrage. 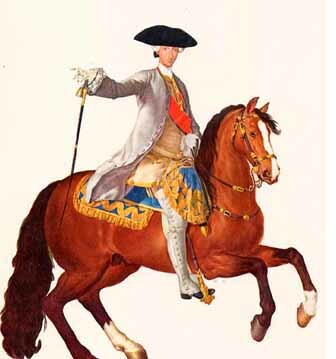 On the political scene back in Naples, Charles III had returned to Spain in 1759, leaving his kingdom in the hands of his good-natured, but not very bright son, Ferdinand, still a minor. Ferdinand ruled through a regent, Tanucci, until he was old enough to marry, in 1767. He married Maria Carolina of Habsburg, daughter of the Empress Maria Teresa and sister of Marie Antoinette. The King eventually became known as King Lazzarone (see above) —perhaps "Beggar King"—a term of endearment, really, since it showed how much the people considered him one of them. He was quite content to wander down to the fish market and sell fish with the merchants, leaving his young, brilliant wife to rule Naples—which she did. In 1776, she junked Tannuci, who had ably stayed on as Prime Minister. 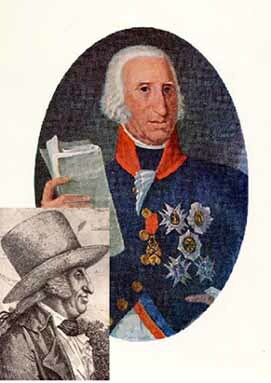 Then, she replaced him in 1778 with John Acton (1736-1811), born in France of English origin and described as an "admiral" in some sources, but in others as a "freebooter." She later made him Secretary of State and, apparently, her lover. During these years, Queen Caroline spared no effort to make Naples another Vienna and Paris—at least in the glittering, aristocratic sense. History, in a sense, is made by those who write about it. That is to say, you get widely disparate views on the same person, depending on who is doing the telling. One of the least flattering views of Eleonara is to be found in The Bourbons of Naples (Acton 1957, below—indeed, related to the aforementioned admiral). She was a writer of "Metastasian rhapsodies"; she was "that exalted blue-stocking Eleonara Fonseca Pimentel..." one of those who "longed to deliver [her] country to the French"; one who "declaimed her latest effusion, a 'Hymn to Liberty'..."; "...an earnest idealist with little practical experience of mankind". At one point, in citing Eleonara's declaration that "Democracy and true liberty render people gentle, indulgent, generous and magnanimous," the author simply says that Eleonora looked at the world through "rose-colored spectacles". All in all, it is a picture of a poor little rich girl, flightily enamoured of the ideals of the French Revolution but without the foggiest idea of what really makes the world go round. 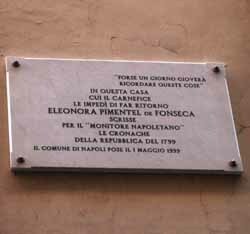 If there had never been a French revolution and a subsequent Neapolitan revolution, Eleonora Fonsenca Pimentel would still be remembered as a minor poet in Italian literature of the 18th century. Her literary output starts in 1768 with an epithalamium, a nuptial hymn, on the occasion of the marriage of King Ferdinand and Queen Maria Carolina, some 600 lines of verse praising the accomplishments of the conjoined dynasties, the Bourbons and Hapsburgs. She was 16 when she wrote it, and it was so impressive that she was promptly accepted into the Arcadia, the Neapolitan poets' circle of the day, where she became the new, young voice. She wrote sonnets and verse in Latin as well as Italian, and she wrote a number of cantatas and oratorios. Much of her literary output—as was customary among lettered people of the day—was given over to voluminous exchanges of letters with other literati. 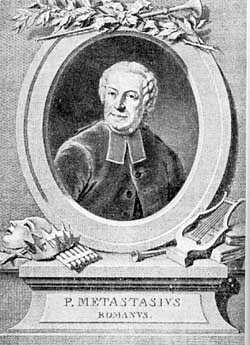 Most prominent of these is a long correspondence in the 1770s with Pietro Metastasio (illustration), the Italian court poet in Vienna and greatest librettist of the 18th century. She had started the exchange by sending him a copy of her first work, the one written for the king and queen. Metastasio praised it, and by the end, in his seventies, was writing her letters calling her the last of the great seductress poets and how he wished he was younger! Her last writings, of course, are from 1799, when she wrote most of the material for, and edited, the Monitore Napoletano, the newspaper of the Neapolitan Republic. She had started out as the little Portuguese princess poet, darling of the court, and wound up as the fervent, revolutionary newspaper editor, writing hymns to liberty and calls for social justice. If one has to find a point at which Eleonora's efforts turned away from the lofty classicism of the 18th century literary circle, it would be in 1785. She became legally separated from her husband and returned to to her father's house. Her father died in that year, and from then on she concerned herself with Enlightenment issues—economics, law, and advancement of the natural sciences. In the years following the French Revolution, she dedicated herself to translating literature of social reform and even revolution into the Neapolitan dialect so that the people she thought she was helping to transform might better understand the issues. She does truly seem to have been convinced of her lines (cited above) that "Democracy and true liberty render people gentle, indulgent, generous and magnanimous." It is difficult to know what would have happened if Naples had not acted first. 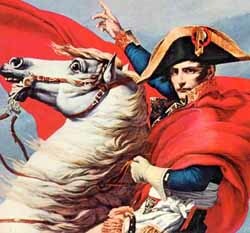 But King Ferdinand, in a show of bravado, sets off to liberate Rome from the French in 1798 and is routed. He flees back to Naples, giving the local street wags the opportunity to mock him with a paraphrase of Caesar. "Ferdinand—he came, he saw, he ran." The King and his army are pursued back to Naples by the French army. This sets the stage for the overthrow of the monarchy in Naples. With the French at the gates, Ferdinand and Caroline flee to Sicily, accompanied by British ships under the command of their English ally, Admiral Horatio Nelson. The French wait outside the city until the revolutionaries take the city after a week of utter chaos in the city, horrors that include manhunts, torture, and, apparently, even cannibalism. The rabble lazzaroni, seeing their king leave, hunt down and torment and murder as many Jacobins as possible. The Jacobins, in turn—the middle-class, the teachers, merchants, lawyers, writers, and rebel officers and troops—take the city from the last troops loyal to the king. The last scene is at the Sant'Elmo fortress overlooking the city, where a force led in person by Eleonora Fonseca Pimentel—now poet turned passionaria—obtain the capitulation of the royalist forces. The Republic is proclaimed on January 21, 1799. Liberty, Fraternity and Equality have arrived. The surrender of Naples to the returning forces of the King involved a staggering bit of treachery. The royalist forces bargained their way into the city by guaranteeing safe passage to France—the revolutionary motherland—for Republican defenders of the city, meaning, largely, members of the Republican government and prominent revolutionaries, including Eleonora Fonseca Pimentel. The surrender took place, and those who were to leave for France were put on ships in the bay of Naples. 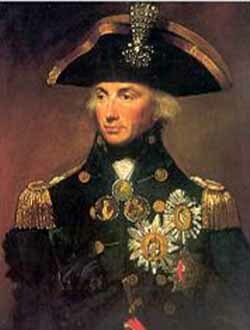 At that point, Admiral Horatio Nelson—acting on orders from the Queen relayed to him apparently by his mistress Lady Hamilton, good friend of the Queen, went out and took the prisoners off the ships. They were to be tried. 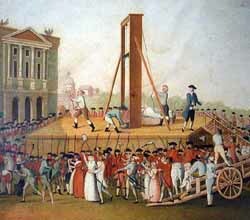 Queen Caroline had said a few years earlier that she "would like to be Robespierre" (cited in Albanese 1998). At long last, she was going to get her chance. She would have her revenge. Stendahl, in Rome, Florence and Naples (1826) , reports at length a conversation about the Neapolitan Revolution and its grisly conclusion with a young man he identifies only as T***, an eye-witness to the events, themselves. Stendahl concludes: "I have been careful to suppress, during the course of this narrative, all the more gruesome details. Robespierre, whatever his faults, has this at least to be said in his favor: he did not count a majority of personal friends among the total number of his victims. Those whom he sacrificed, he sacrificed to a system, however ill-founded; not to his petty, personal spite." On the first Sunday in May, the other time when the "miracle" is said to occur, it didn't. This provoked the French commander --desperate to win popular support for his troops occupying the city-- into the interesting move of threatening to kill the Archbishop of Naples if the sign from Heaven were not forthcoming. A short while later it came, thus lending, at least in the mind of the French general --and notwithstanding skeptical popular charges of pseudo-divine hanky-panky-- credence to his claim that God was on the side of the Revolution. Diana, Roasario. Forward to Vincenzo Cuoco, Platone in Italia. Naples: Pagano, 2000. Fortunately, Naples goes on periodic binges of restoration: a Roman market here, an Angevin castle there—you can do a lot with 2,500 years of history. One of the delights, then, of walking around at random is finding such a place. I stepped through the large portal of a building I had never visited before and got one of those Wizard of Oz moments (when Dorothy, in the MGM film, opens the door of her house, which has just bounced down in Oz, and the film suddenly goes from black and white to color). I didn't start to sing, but I think I might have gasped briefly. I was in the newly restored courtyard of the old monastery of Saints Marcellino and Festo. It was tidy and colorful, newly painted, with a hypnotic series of arches running around the perimeter of the courtyard. Also—at least when I was there—there were some very small gardeners tending the ample vegetation. That added to the Munchkin effect. Since much of it happened by way of southern Italy, I think I can justify sneaking it in, here. 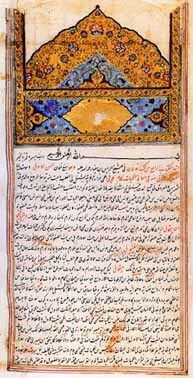 This is an early-15th-century Persian copy of the opening page of Book Four of Ibn Sina's (Avicenna) Canon of Medicine, written in the 11th century, parts of which were used in European medical schools as late as the 19th century. Dangling in the southern winter sky and very visible from my balcony in Naples is the great equatorial constellation of Orion. The second brightest star in that constellation is the red supergiant, Betelgeuse. (This is the first of a few familiar names coming up that no one knows how to pronounce. Another one is "Averroës.") Betelgeuse is 390 light years from my balcony and, thus, remote from the various fields of human conflict that are responsible for my knowing neither the pronunciation nor the original name of the star—thus, our high school astronomy club's cutesy mnemonic of "Beetle Juice." I don't recall ever learning that the name came from the Arabic bayt al jauza, meaning "in the house of the twins," referring to the Heavenly Twins, Castor and Pollux, hanging out right above Orion. Speaking of high school, I did not do well in mathematics, but I am willing to give Al-Khwarizmi (known to us as Algorizm!) (770 - 840) his credit if he takes a bit of my blame. I will take all the blame for not knowing who Chaucer was talking about in the Canterbury Tales, when, in praising the knowledge of the doctor on the trip, he reminded us that ye olde pilgrim sawbones was familiar not only with Hippocrates and Galen, but "Rhazes, Hali, Averroës and Avicenna." It is convenient—but not a good idea—to pigeonhole our own cultural history into tidy episodes: The Renaissance, The Age of Reason, The Enlightenment, The This & That, as if they had happened all of a sudden with no connection to anything else—as if Leonardo woke up one fine morning in 1500, looked at his homemade (obviously) hour-glass and said "Gee, it's the Renaissance; I'd better design a helicopter." The point of this entry, then, is simply to draw your attention to how interconnected European and Arabic culture used to be, and how there is a link between the glorious age of Arab science and culture (800-1100) and the beginnings of the Italian Renaissance. (I am not making the post hoc, ergo propter hoc mistake of saying that that which comes first necessarily causes that which comes second. I am simply saying it's a good idea to know what came before you—Bonum est quod ante te evenit scire (I think) . After Islam's rapid spread from Spain to India, Muslims founded the city of Baghdad in 800, and it is here that the Muslim quest for knowledge begins, the manifestation of an insatiable curiosity (to use Einstein's choice phrase from many centuries later) "to figure out how the Old Man runs the universe." It is in Baghdad that the Muslims founded their great school of translation, the incredible ambition of which was to translate as much as they could find of science, astronomy, mathematics, music, geography and philosophy—whatever remained of Classical Greek knowledge. It meant going even further afield—to India—to study the mathematics and philosophy of those who had written in classical Sanskrit centuries earlier. In 800 this was by no means an easy task. Much classical Greek writing had not survived the centuries of neglect by Christians inimical to "pagan" thought. As early as the year 500, the great library at Alexandria was a ruin and, a few years later, Justinian closed Plato's Academy in Athens because it was a hotbed of pagan (non-Christian) philosophy. Arab scholars, then, translated into Arabic the few Greek texts that remained, or translated from languages into which the Greek originals had previously been translated by scholars who had left Greece for parts east. These were mainly exiled Nestorian Christians from Greece, and Classical Greek scholars from Plato's academy who had fled to Persia, where they founded a great center of learning at Jundishapur (before the coming of Islam) and translated much of their material into Aramaic, the lingua franca of the Middle East at the time. After Baghdad, the Arabs later started equally fine centers of scholarship in Spain at Cordoba and Toledo. Transmission of this glorious knowledge from The Muslim world into Italy happened primarily through Spain and Sicily; that is, the great courts of learning in Cordoba and the pre-Crusades court of Norman Sicily in the 12th century. It is in Sicily, particularly, that Norman tolerance provided for the coexistence of Byzantine Greek, Italian Christian, and Arab scholars. It was, perhaps, the last great period of human tolerance in European history. One of the great medical translators from Arabic into Latin was Constantine of Carthage (known as "The African"). In the middle of the 11th century, he came to teach at the medical school in Salerno , the first of its kind in Europe, bringing with him his vast library of Arabic medical works, including, no doubt, Avicenna's Canon of Medicine. That work was translated into Latin and used as a text in European medical schools well into the 17th century, and parts of it were current as late as the early 19th century! In 1127, a European translator, Stefano of Pisa, reported that scholars of medicine were all still found in Sicily and Salerno, and were generally persons who knew Arabic. Again, we shouldn't set up a necessary chain of cause and effect; yet, there is surely a link between earlier Muslim medical thought (the view that "God has provided a cure for all disease"; therefore, it is our rational duty to find those cures) and the final abandoning by the Christian west of the view that prayer and mortification of the flesh cured illness. In Palermo, Emperor Frederick II (1194-1250), in spite of the Crusades, was driven by his own enormous intellectual curiosity to explore Arabic culture. He is known for his exchanges of letters on philosophy and science with Arab scholars. A prominent member of the court of Frederick in Palermo was the great Italian mathematician, Leonardo Fibonacci, the inventor of the arithmetic series that bears his name. (Quick! what is the next number in this series: 4, 1, 5, 6, 11, 17...)? He had studied with Arab mathematicians, and he is also the reason you don't have to do that last problem as "IV, I, V, VI, XI, XVII..."; that is, he introduced "Arabic" numerals into Europe (they were really Indian numerals that the Arabs had picked up in their wanderings). Frederick’s court is also responsible for giving us a Latin translation (from the Arabic translation of the Greek) of Ptolemy's Almagest, and for translating the original works of the great Arab astronomer, Al-Farghini. Frederick II's interests are so wide ranging that it is no wonder he was well read in Arab philosophy and science. 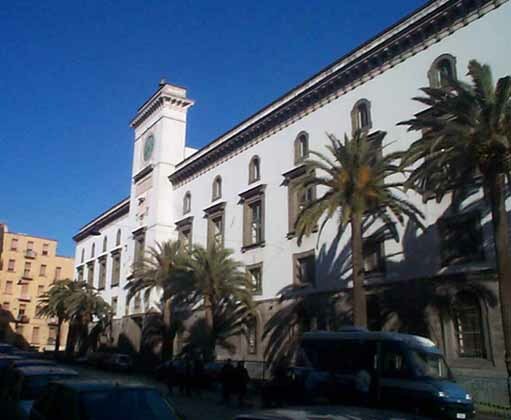 He expanded the medical school in Salerno and started the University of Naples, which, today, still bears his name. Michael Scot (1217-1240) was perhaps the finest mind at the court of Frederick in Palermo. From Scotland, he had worked at the great Arab translation center in Toledo and is responsible for giving us Latin versions of the philosophical works of Avicenna and Averroës, particularly the latter's commentaries on Aristotle. From royal courts to fledgeling universities, Italy in the 1100s and 1200s, then, seems to be a scene of Europeans scurrying to read the next installments of Arab works, particularly in philosophy, medicine and astronomy. Muslim religious philosophy is of particular interest. Al-Kindi (d. after 870) was the first important Muslim philosopher. He held and taught that revealed truth (religion) and rational truth were not in conflict, but were complementary—even identical. Then, Al-Farabi (874-950) elevated philosophy even above the revealed truth of the sharia, the religious law of Islam, and held that our goal is to develop our rational faculty. Ibn Sina (981-1037), known in the west by the Latin name, Avicenna, is often called by Westerners the "Arab Leonardo" for the amazing breadth of his knowledge in medicine, philosophy, mathematics, and astronomy. In addition to his Canon of Medicine (mentioned above), he is certainly one of the most remarkable thinkers of the Middle Ages and the most important and original of all Muslim philosophers. His held that religion was a kind of philosophy for the masses; the goal of all revealed truth (including his own Islam) was to lead us to our highest state—one of philosophic contemplation. He held the particularly original idea that intellectual discovery implies an intuitive act of knowledge. The idea of the intuitive intellect working outside of the methodical process of collecting facts and deduction has again become quite modern. Perhaps Ibn-Rushid (Averroës) 1128 -1198 is also of great interest to us. He wrote many commentaries on Aristotle and is known in Arab philosophy simply as "The Commentator." His works in religious philosophy were widely read in Europe, especially by Thomas Aquinas, the point, of course, being not that one was right and the other wrong, but that one of the greatest of European medieval philosophers honed his own sharp intellect by dealing with his Muslim predecessor. Averroës' work in law, medicine, and astronomy were also highly regarded. Hardly mentioned at all when you read about the Arab influence in European thought is the extent to which Arab literature might have had any influence on European medieval literature. There are a number of possibilities. It may be that the Arab habit of composing popular poetry in vernacular Arabic in Sicily and Spain had some influence on the subsequent "vernacularization" of not only European court poetry and song in the Provence (the Troubadours) and Sicily, but even in the beginnings of great European vernacular literature. In A History of Islamic Sicily, Aziz Ahmad dwells on the controversial connection between Dante's Divine Comedy and prior Islamic works of the same nature. There is no real conclusion to be drawn, except the possibility that our great originator of non-Latin Romance literature got some inspiration from somewhere. 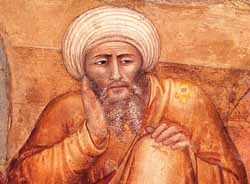 Dante certainly knew of Avicenna and Averroës through Latin translation; in the Divine Comedy, he places them both in Purgatory with the great pre-Christian scholars of ancient Greece. (Dante was not so kind to Mohammed, himself, though, who, in Canto 28, is in Hell as a Sower of Discord). Did Dante also know (through its Latin or Early French translations) of The Book of the Scale, an earlier Arab eschatological work that has interesting parallels in the Divine Comedy? Again, we should beware of post hoc reasoning,but it is an intriguing possibility. It was under the influence of the Arabs and Moorish revival of culture and not in the 15th century, that a real renaissance took place... After steadily sinking lower and lower into barbarism, it [Europe] had reached the darkest depths of ignorance and degradation when cities of the Saracenic world, Baghdad, Cairo, Cordova, and Toledo, were growing centers of civilization and intellectual activity. It was there that the new life arose which was to grow into a new phase of human evolution. From the time when the influence of their culture made itself felt, began the stirring of new life. Those are strong words that I do not entirely accept. Yet they remind us that our ethnocentric view of our own cultural history as a straightforward chain of events is not very helpful. Perhaps we should step back and view all of culture as a vast web of ideas; they may spring forth in different places at different times—or many of them at the same time, unnoticed elsewhere. Ahmad, Aziz. A History of Islamic Sicily. New York: Columbia Univ. Press, 1979. 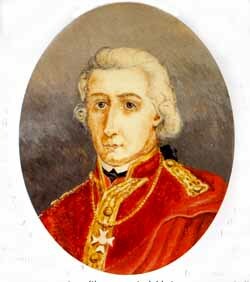 Briffault, Robert. The Making of Humanity. London: 1938. Gutas, Dimitri. Greek Thought, Arabic Culture. London: Routledge, 1998. Lunde, Paul. “Ishbiliyah: Islamic Seville.” Aramco World 44.1 (Jan/Feb) 1993. Marmura, Micahel E. "Avicenna." The Encyclopedia of Philosophy. New York: MacMillan, 1967. Rahman, Fazlur. "Islamic Philosophy." The Encyclopedia of Philosophy. New York: MacMillan, 1967. Rosenthal, Franz. The Classical Heritage in Islam. Trans. Emile and Jenny Marmorstein. In series: Arabic Thought and Culture. London: Routledge, 1992. Tschanz, David W. “The Arab Roots of European Medicine.” Aramco World May/June 1997. Unesco Courier, The. September, 1986. Title of issue: "Averroes and Maimonides: Two Master Minds of the 12th Century". Paris: Unesco, 1986. Wilson, N.G. From Byzantium to Italy; Greek Studies in the Italian Renaissance. London: Duckworth, 1992. 6) The cliffs along the Sorrentine peninsula, which give you, the spectator, a good view of how mountains are thrust up above the surface by subterranean activity and then worn away and eroded into the shapes we see today. All of the above items, except erosion, are manifestations on the surface of activity below us. For the last forty years, geologists have been refining the theory of "plate tectonics" to describe the phenomena of "sea-floor spreading," and "continental drift," phenomena that are the direct cause of earthquakes and volcanoes. The outer solid mineral crust of the earth is called the "lithosphere". It is a rocky layer underlying the continents and ocean basins, varying in thickness from almost zero at the mid-ocean ridge crest to over 100 km when carrying an imbedded continent. It is helpful to visualize this layer as relatively thinner compared to the earth than the skin of an orange is to the fruit, itself. Below the crust lies the mantle, a layer of rock extending to a depth of about 3,000 km, or halfway to the center of the Earth. Parts of the mantle get so hot that rock becomes molten and moves slowly in vertically rotating currents. This is convection, the force that drives continental drift. Below the mantle is the core of the Earth, a ball about 2,500 km in diameter consisting of a fluid outer layer and a solid center, both mostly of iron and some nickel. The continents and ocean basins are the upper portion of the lithosphere. The lithosphere is fractured at various points around the planet, giving us a global jigsaw puzzle of tectonic plates. There are about a dozen major tectonic plates and several dozen small—even tiny— ones (some of them are only the size of a big county and are often called “mobile terrenes”). When tectonic plates move, they do so along fracture lines, the borders of each plate that define the actual pieces of the gigantic jigsaw puzzle. The plates move apart undersea and form large mid-oceanic rifts and then ridges, true undersea mountain ranges, formed over the course of millions of years as hot magma flows from below the lithosphere up into the rift. It is this sea-floor spreading—driven by the convective movement of the internal heat of the earth—that drives the entire process of continental drift. Tectonic plates have existed since Earth's molten inception 4.65 billion years ago. It was the cooling of the crusts that made for the first tectonic plates, a model that can be seen on any cooling lava lake. (I have been told that it is great fun to put on a good pair of hiking boots and go running across the cooling crust of a lava lake. I have also been told that it is important not to trip and fall.) A particularly dramatic example of very ancient tectonics is the Ural Mountains, a classic collision plate boundary. Likewise, the Appalachians mark a very ancient closure of a proto-Atlantic; the continents then severed again, shearing the old Appalachian plate boundary between the US and Scotland. (3) Heat from the decay of radioactive elements; the magnitude of this third main source of heat—radioactive heating—is uncertain. The precise amount of radioactive elements (primarily potassium, uranium and thorium) in the deep earth is poorly known. In other words, there was no shortage of heat in the early earth, and the planet's inability to cool off quickly results in the continued high temperatures of the Earth's interior. In effect, the earth's plates act as a blanket on the interior, and even convective heat transport in the solid mantle does not provide a particularly efficient mechanism for heat loss. Our planet does lose some heat through the processes that drive plate tectonics, especially at mid-ocean ridges. For comparison, smaller bodies such as Mars and the Moon show little evidence of recent tectonic activity or volcanism. Meanwhile, back on Earth, as new material is pumped into the rifts formed by sea-floor spreading, adjacent plates shift along the fracture lines causing the global jigsaw puzzle to slowly reassemble itself into ever-different configurations. Important in this view of the dynamics of the earth's surface is the fact that during the process of sea-floor spreading and rift formation, spread to both sides then causes some plates to come together elsewhere with varying results. The most important force in this spread is the pull of old, thick, relatively cold lithosphere into the trenches, with a little help from drag along the bottom of the plate. Ridges start as passive cracks opened by plates being dragged away to either side. Nature, abhorring a vacuum, then fills the cracks with lava. Again, the entire process of plate tectonics and continental drift is driven by convection --the enormous heat within the earth drives molten material towards the surface. Some of this material may escape to the seafloor, itself, to add to the great undersea mountain ranges; the rest cools and sinks to be recycled into a later round of convection. When a relatively new (and therefore thinner) oceanic plate hits an older oceanic or a continental plate (both thicker than the youngster), a trench forms along the tectonic fault. Then, one of two plates coming into contact can subduct—go into the trench and under the other plate—forcing it up and producing great mountain ranges such as the Rockies, Andes, Alps, and Himalayas. (It is helpful to think of tectonic collisions as agonizingly slow car crashes!) (Note that some mountains, however, are caused also by direct volcanic activity, huge bursts of solid and molten material vented through fault lines at great pressure onto the surface.) The heavier subducting layer will eventually cycle back down into the hot magma below the lithosphere. The process of spreading on one end and subduction on the other suggests the picture of a continuously manufactured, one-way conveyor belt. This relatively new theory of "plate tectonics" is a beautiful one, because it explains so much at once, which is what good science is supposed to do. The theory takes sea-floor spreading, continental drift, mountain building, earthquakes and volcanic activity and ties them together. Indeed, the theory explains why the continents exist at all. Without plate tectonics creating rock piles, most of our planet would erode below sea level in a few tens of millions of years. Though mid-oceanic ridges were discovered through primitive string soundings by the H.M.S. Challenger in the late 1800s, refining a theory of plate tectonics depended on figuring out what kind of powerhouse energy source could possibly drive continents around the globe. That problem was solved with the development of underwater mapping techniques in the 1960s and the actual observation of planetary convection at work, basaltic magma flowing up onto the seabed from below. Remember that two-thirds of the surface of the earth is sea floor, made up entirely of sediment-covered basalt. Water conceals from our direct view such wonders as the great mid-ocean ridges, the combined lengths of which are some forty-thousand miles long. In places the ridge is 600 miles wide and two miles high, an uninterrupted, mammoth line of magma venting up to the seafloor for hundreds of millions of years. To get an idea of that, go out and look at Mt. Vesuvius; imagine it twice as high, then twice as wide as Italy —and stretching almost twice around the world! Much earthquake and volcanic activity on the surface of the earth is found along the lines of tectonic fractures. Italy is at the meeting point of a few of these tectonic plates. The movement below has formed the Italian peninsula and is the source of Italy’s great natural beauty and much of its considerable history of natural catastrophe. In broad terms, the entire Mediterranean Sea was brought into existence about ten million years ago by the coming together of the African tectonic plate and the plate that makes up the greater Eurasian landmass to the north. In the case of Italy, the prominent mountain range, the Apennines, the "backbone" of Italy, resulted from the collision of the smaller Apulian plate with the Iberian plate. The mountains formed, and islands such as Sardinia and Sicily surfaced. The entire fault line that runs the length of Italy was then primed to produce volcanoes and geothermal activity on the surface along the line of the tectonic fracture, an obviously weak chink in the earth's armor and a natural place for internal energy and heat from the inner earth to vent to the surface. Today’s earthquake and volcanic woes along the west coast of Italy, on the Aeolian Islands, and on Sicily are a direct result of on-going subterranean activity as the great African Plate, which contains the Mediterranean and Italy, subducts below Europe via movement somewhat slower than the growth of a fingernail. The Alps mark the collision of Africa and Europe. Putting additional crunch on Italy is the plate that bears the Balkans; it is subducting beneath the eastern side of the Italian peninsula, yea, even as we speak. A volcano is a conical mountain built up around a vent in the crust of the earth. Imagine the structure of a large tree below the surface; it is rooted below the crust of the earth in a magma chamber and vents through the main trunk up to the surface. This magma chamber is the bulge of molten material from below the lithosphere that has worked its way up into the actual crust, forming a deposit close to the surface, from whence it will ultimately vent. The trunk vents and forms the main crater; also, there are side branches coming off to form what are called "parasite cones." (Other types of volcanoes, such as "fissure" volcanoes, don't fit that conical configuration, but the principle of venting from a magma chamber through the lithosphere to the surface is the same). Here, a word about "lava." Though it is a synonym for “magma,” it generally refers to the flow of magma from a volcano and not to the stored magma in the chamber beneath a volcano. Apparently, Neapolitans were the first to use the word “lava” in its volcanic sense. The magma issuing forth from Vesuvius offered the analogy to a flow of water (lavare means "to wash"). Again, magma is the molten mineral material stored below the lithosphere in a stratum called the asthenosphere, a few hundred miles thick, material that is then ejected by an erupting volcano. The viscosity of magma and the speed and surface appearance of a lava flow are determined by the silica and water content. A high silica content makes the lava very thick so that it flows very slowly or just piles up above the vent to form a “dome”. Geologists take great care to measure the minute changes in a volcanic dome in order to determine the swelling that is often a harbinger of impending eruption. Less viscous lava flows more rapidly, such as Ol Doinyo in Tanzania, which erupts like muddy water. Thus, lava types vary greatly from place to place on earth and, indeed, throughout our solar system. The dominant type of lava flow underwater is called “pillow” lava and is characterized by long tube-like structures that in cross-section look like elliptical pillows. It is this kind of lava that forms the great mid-ocean ridges. Volcanoes can be classified in various ways: e.g., as extinct, dormant, or active; or according to the viscosity of magma that they eject. One convenient classification is based on the way they erupt: explosive, effusive, or intermediate. Explosive volcanoes are those which give us great catastrophes: the eruption on the island of Santorini, which destroyed the ancient Minoan civilization on nearby Crete in the second millennium before Christ; the famous eruption of Vesuvius, which destroyed Pompeii and Herculaneum in the first century, a.d; that of Krakatoa in the 1880s; the recent eruptions of Mt. St. Helens in the 1980s and Pinatubo in the Philippines in 1991; and the recent eruption on the island of Montserrat. These eruptions are sudden, throwing up massive amounts of magma and solid material quite rapidly. The volcanoes do, literally, explode, often tearing off the top of the volcano, itself. Effusive volcanoes, such as those on the island of Hawaii, give off a constant slow flow of magma. Over the course of many eruptions, the lava flows build up and, little by little, produce a large, gradual slope. Mt. Etna on Sicily is another volcano of this kind. Some volcanoes are termed "intermediate" because in the course of their history they have been both explosive and effusive. Vesuvius is now classified as an intermediate volcano because the most recent eruptions—going back to 1631—have been effusive. Before that, Vesuvius had a more violent history. There were, for example, explosive eruptions in much of the 1600s, a century of such considerable seismic activity that a mountain, Monte Nuovo (New Mountain) surfaced in nearby Pozzuoli. Large volcanic eruptions have significant effects on the atmosphere and on global climate. It is true that eruptions produce major quantities of carbon dioxide (CO2), a gas that contributes to the greenhouse effect, but human activities generate more CO2 than do volcanic eruptions—about 10,000 times as much! By far the greatest climatic effect from volcanoes comes from the production of atmospheric haze. Large eruptions inject ash particles and sulfur-rich gases into the atmosphere; these clouds can circle the globe within weeks—even days—of an eruption. The ash particles decrease the amount of sunlight reaching the surface of the earth and lower average global temperatures. The Krakatau eruption on August 26 and 27, 1883 put about 20 cubic kilometers of material in an eruption column almost 40 kilometers high, and by the next day the haze had reached South Africa; two days later it had circled the globe. Global temperatures are affected, not so much by the volume of ash in the atmosphere as by the chemical composition of the gases thrown up by the eruption. A smaller eruption in terms of explosiveness and volume of ash produced can have a longer-lasting effect if it injects more sulfur into the air. These so-called "sulfate aerosols" can take several years to settle out of the atmosphere, thus producing greater global cooling. A sulphur-rich eruption such as El Chichòn in 1982 can lower the temperature by half a degree centigrade in the entire hemisphere for a number years. The wrathful sunset glared against a cross…"
The most famous volcano in the world is known to geologists as the Somma-Vesuvius volcanic complex. It is a composite, really made up of an older volcano, Monte Somma, the activity of which ended with a summit caldera collapse, and of a more recent cone, Vesuvius, contained within the caldera. In a generally accepted chronology of the volcanic history of this area, eight main eruptive cycles of Vesuvius within the last 17,000 years are recognized. Each cycle started with a highly explosive eruption that occurred after a long quiescent period measured in centuries. The a.d. 79 "Pompeii" eruption opened the last cycle, which went up to 1944, the year of the last eruption of Vesuvius. The period between 1631 (the year of the last explosive-type eruption) and 1944 is characterized by relatively mild activity (lava fountains, gases, and vapor emissions from the crater), frequently interrupted by short quiet periods never longer than seven years. There have been so many documentaries about the eruption that doomed Pompeii and Herculaneum that what follows may not be new information to you. Simply note, however, that the victims were not overrun by lava. Although people have been killed by very liquid lava flowing very fast, most of the time that is not what kills victims of volcanic eruptions. Indeed, Pompeiians were killed by what is now called the "surge and flow" of an exploding volcano. When Pompeii "blew,” it did so for about eleven hours, first exploding its top into oblivion and then venting a 12-mile high column of noxious gas and pumice into the stratosphere. The column hung in the air and then collapsed back down onto the slopes and "surged,” producing a very fast (in excess of 100 mph) avalanche of superheated gases, pumice, and rock rushing down the slopes. Behind that surge came the somewhat more slowly moving "pyroclastic flow," a ground-hugging mass of more solid molten material and gasses. Vesuvius surged and flowed at least four times within a few hours after the eruption. The inhabitants of Pompeii and Herculaneum suffocated, many of them because they figured they were safe. It is almost common sense that if the eruption doesn't get you —if a hot boulder doesn't land on you— then you're safe, right? Wrong. You cannot outrun a surge. Bear in mind that this description of the lethal surge and flow after a main eruption is a recently arrived at (19th century) description of the dynamics of volcano behavior, a scientific topic the ancient Romans knew little about. Interestingly and very recently (late 2001), archaeology around Vesuvius near the town of Nola has shed light on the fate of a so-called “Bronze Age Pompei.” In about 1800 b.c. —roughly about the same time as Hammurabi was formulating his exemplary Code in far-off Babylon—a little village on the slopes of the volcano was buried by an eruption. The site is already recognized as one of the world's best-preserved prehistoric villages, found only because someone decided to build a supermarket with an underground parking structure. Thus far, no human remains have been uncovered, indicating that the inhabitants had enough time to avoid the fate of the some 2,000 victims of the Pompeii eruption. Again, when tectonic plates move, various things can happen on the surface. Mountains can form as subduction occurs; also, when plates rub together, or strike and slip, energy is released upward along fault lines. This produces earthquakes and volcanic eruptions. Most volcanoes erupt along or near tectonic lines. The rest, far from tectonic zones, result from still mysterious and relatively fixed "hot spots" (like Hawaii) which scar the moving plate with mountains while hiding their deep-seated roots (much deeper than 100 km, possibly even a core-mantle boundary source). To add to the complexity, deep hotspots can erupt through tectonic zones, themselves (Iceland, for example, is the result of such activity). Moving around the bay to the west, we come to Pozzuoli and the aptly named Campi Flegrei —Phlegrean ("Fiery") Fields. That part of the Bay of Naples is pock-marked with extinct volcano craters from millions of years ago and some craters from as little as 35,000 years ago (the great Pozzuoli caldera). It is also the site of venting fumaroles, hot springs and thermal baths, and one big bubbling sulfur pit called Solfatara, all signs of geothermal activity. Heat from below the surface—either by conduction through the rock or by direct infusion of magma—heats the groundwater contained in reservoirs below the surface. Depending on the make-up of the surface rock—how permeable it is, for example—surface activity will manifest itself as bubbly hot springs, or venting steam, or even slight seismic shifts as the ground rides up and down on the geothermal activity below it. These slight shifts are called "bradiseisms," meaning "slow shaking." Though we say "slight," these small tremors are enough to raise or drop the ground surface by as much as a few meters in a single decade and cause considerable shift in sea level. The port facility of Pozzuoli has had to be rebuilt in the last few years to adjust to the perceived drop in local sea level —the ground rose, actually— caused by bradiseismic activity in the early 1970s. The famous tourist site, the Roman market in Pozzuoli, which was partially under water in 1970, is now totally on dry land. The bradiseisms in the area came at about the same time as the big Naples quake of 1980, so presumably they are geologically connected. For example, the same energy release that triggers a quake along a fault might also vent heat energy into adjacent groundwater reservoirs, raising the temperature, increasing the bubbling, and causing the ground on top to jiggle. The extinct craters in Pozzuoli are part of an enormous chain, now undersea, which runs out to the south on the seabed in the direction of Sicily. The entire sea between the Bay of Naples and Sicily thus contains its own "Ring of Fire," so-called in analogy to the mammoth ring of active volcanoes that perch on the perimeter of the great Pacific tectonic plate. Mt. Vesuvius has four undersea cousins to the south: Palinuro, Vavilev, Marsili, and Magnaghi. The last three were discovered in the 1950s and bear the names of the geologists who discovered them. Palinuro was known earlier. At present, there is some concern about the state of "dormancy" of Marsili. It is 3,000 meters high with the cone reaching to 500 meters from the surface of the water. Satellite cones of recent origin have been detected on Marsili. The entire "Ring of Fire" includes, then, Vesuvius; the extinct volcanoes of the Pozzuoli area (mentioned above); the volcano Epomeo on the island of Ischia; the four above-mentioned undersea volcanoes to the south; the active island volcanoes of Ustica, Stromboli, and Vulcano off the north coast of Sicily; the largest active volcano in Europe, Mt. Etna, on Sicily; and, finally, the volcanic island of Pantelleria, to the south of Sicily. It last erupted in 1891. That area of the "Ring of Fire" has at least one comic-opera-type episode connected with it. During the night of June 27, 1831, a small island surfaced off the coast of Sciacca, near Agrigento in southern Sicily. English, French and Neapolitan vessels raced to the scene to claim the island. The Neapolitans won and hoisted the flag of the Kingdom of the Two Sicilies, naming the new acquisition "Ferdinandea" for their King Ferdinand. Unfortunately for the bureaucrats and would-be colonizers, the island disappeared a few months later. Fortunately for 21st-century scuba divers, however, the island didn't sink that far, and now a good-sized underwater nature reserve thrives about 30 feet below the surface. The "Ferdinandea" episode made the papers in the summer of 2002 due to recent rumblings and small "seismic events" in the area. Active fumaroles are venting from the slopes of the sunken island. Is the island about to resurface? Probably not, say local geologists -- but these are the same people who call earth- and seaquakes "seismic events." Time will tell. One still significant feature of the Pozzuoli area is the famous Lake Averno, where Virgil accompanies Dante into Hell in the Divina Commedia. Mythology held the lake to be the descent into the underworld. It stank then of sulfur, as it does today, though the real stench of rotten eggs is a mile or so away at the nearby Solfatara pit. It is a bubbling brew of sulfur, and the venting fumaroles in the area are believed to possess medicinal properties. Pozzuoli and the offshore island of Ischia are also the sites of numerous thermal spas. To take a long view, much of this volcanic activity certainly took place when the Mediterranean dried up about seven million years ago. Continental drift had actually created a large enclosed sea, which then evaporated, leaving thick deposits of salt between Italy and Spain. Oceanologists have now seen how the rivers of France carved deeply into such deposits at the bottom of the great, empty pre-Mediterranean bathtub, proving that it was indeed empty. With only rivers flowing in, this inland sea (like the Black Sea which evaporated at the same time) did, indeed, disappear. Since the time of the Romans, volcanic and geothermal disturbances in the area, as well as the general worldwide rise in sea level have changed the Bay of Naples. Remnants of Roman villas have been found offshore, and the docks of the Roman port facility, Portus Iulius (near Pozzuoli), are now underwater. At the height of the Empire, it was the main port for the Western Roman "Praetorian" fleet. This facility connected the sea, by manmade canal, with the two nearby lakes, Averno and Lucrino, as well as with the small Bay of Miseno at the western end of the gulf. The recent (1538) volcanic appearance of Monte Nuovo destroyed much of Lake Lucrino. Some slipshod, recent maps of Roman Pozzuoli show the anachronism of Monte Nuovo, making it impossible today to realize that at the time of the Romans no such mountain existed. Instead, there was a much larger lake, now little more than a pleasant puddle, which was a training lake for Roman ships. Also, some Roman roads in the area can no longer be traced along their entire length. The via Domiziana, for example, a main artery from Rome to Naples, tunneled beneath the Posillipo hill on the west end of the Bay of Naples; then, it came out and ran along the sea again. That seaside stretch of road is now covered by water. Capri is not volcanic, but was formed by the same general tectonic plate upthrust that formed the Sorrentine peninsula. When times and sea levels were much different, Capri was an extension of the Sorrentine peninsula. The presumed land bridge may account for the remains of mammoth elephants on Capri. (The alternative is swimming elephants. Pay your money and take your choice.) Finally, have a look at the cliff face as you drive along the peninsula. Note how the strata of the rock face angle up out of the sea and make a mountain. That's all part of a tectonic plate. It's simple. There are about 500 active volcanoes on the land surface of the Earth; also, the tectonic plates that fragment that surface are in constant movement. Thus, your crystal ball can be made of low-grade zirconium oxide and you will still be reasonably accurate if you "foresee" a major eruption or earthquake "sometime this year". What most people mean by prediction, however, is something different. They want: (1) "This particular volcano is about to erupt," and (2) "a 7.2 on the Richter scale is imminent at this particular spot." First, the good news. The outlook for predicting volcanic eruptions is not all that bleak. The United States Geological Survey uses ground-based sensors and high-orbit satellites in its attempts to keep up with volcanic behavior. The sensors pick up underground noises and, thus, know that something is moving. The frequency of the rumblings tells what those materials are. The sensors are tuned to a Global Positioning Satellite (GPS), pinpointing the position of the sensors and allowing a computer to tell precisely where those materials are. This system provides a good picture of the anatomy of a volcano. As a volcano swells with magma, the deformation—as calculated by the GPS—can help determine whether or not an eruption is about to take place. "Sniffing" volcanic gas is another way to keep tabs on high-risk volcanoes. As magma rises in a volcano, light molecules such as carbon dioxide bleed off more than do heavier gases such as sulfur dioxide. The higher the CO2 levels, the likelier an eruption. Currently being tested is a remote gas sensor that detects changes in the infrared energy caused by different gases in the volcanic plume. Being able to gather this information from, say, 20 miles away is much safer than having to climb down inside a crater. So, there is considerable new technology dedicated to the study of at least some well-known volcanoes near major centers of population. This makes it increasingly unlikely that unsuspecting people near these monitored volcanoes will be caught napping by a major unpredicted eruption. A good example of successful forecasting occurred in 1991. Volcanologists from the U.S. Geological Survey accurately predicted the eruption of the Pinatubo Volcano in the Philippines, allowing for the timely evacuation of Clark Air Base and saving thousands of lives. Similarly, new satellite maps of the precise topography around volcanoes are helping in the prediction of “lahars” (a Javanese term), those disastrous monsoon-soaked slurries of mud and rock that can surge downhill weeks or months after a volcanic eruption, often causing more damage at lower elevations than the original eruption. The bad news is that earthquake prediction is staggeringly more difficult—and that is an understatement. There is, of course, the Star Trek scenario: ("Captain, our long-range sensors indicate that this planet will undergo a major earthquake within the next 4-6 hours with the epicenter at 52 degrees north and 12 degrees east"). If that is the kind of predictive abilities you expect, you have a long, long wait—if ever. Predicting earthquakes requires, first, a good knowledge of the geologic history of an area. Then—much more difficult—it takes the ability to isolate what potential "predictors" might precede an earthquake. For example, certain things do happen to rock under stress. Among other things, permeability to water changes, as does electrical conductivity. Also, certain gases might escape before an earthquake, and there might be a slight crustal uplift beforehand. Is it possible to measure any or all of these predictors and come up with some kind of a yardstick—a profile—that might tell us reliably when and where an earthquake is about to happen? The history of science has certainly shown us that those who say that something "will never happen” often turn out to be wrong. In practice, however, such powers of earthquake prediction would require a great number of sensors of incredible sophistication and a knowledge of how predictors correspond to the behavior of rock as it is subjected to the force of tectonic movement. Such powers of prediction would require the ability to model geological phenomena across many orders of magnitude in size from meters to thousands of kilometers and in time from seconds to the speed at which mountains move–eons. In other words, you need a multidisciplinary approach using computational mathematics, computer programming and geology on an imaginable scale –if you have a good imagination. So, while "never" is a long time, the gap between theory and practice is vast. Is it possible, as some have claimed, that certain animals sense an impending earthquake? Well, dogs do hear and smell things we don't, so maybe we shouldn't discount the possibility that they are tipped off a few minutes before an earthquake. On the other hand, until we can figure out a way to ask Fido exactly why he is chasing his tail over there, it is best not to rely too heavily on animal behavior as portents of seismic events. Thus, at present, no reputable geologist will take a greater predictive leap than, perhaps, to say: "Given what we know about the history of this area, there is a 75% chance of a major quake within 10-15 years somewhere in this area." Right now, maybe that’s about the best you can expect. On the other hand, there are recent technological advances that make the Star Trek scenario ever less fantastic. A group of NASA and university scientists at JPL released a study in April 2003 on the feasibility of forecasting earthquakes from space. Their report outlines a 20-year plan to deploy a network of satellites—the Global Earthquake Satellite System (GESS). The system would use Interferometric-Synthetic Aperture Radar (InSAR) to monitor fault zones around the world. InSAR combines two radar images of a given tectonic area in a process called "data fusion" in order to detect changes in ground motion at the surface. This technique is sensitive enough to detect slow ground motions as tiny as 1 mm per year, letting scientists see the tiny motions and contortions of land around a fault line in detail, figure out where points of high strain are building up, and infer when stresses in the Earth's crust have reached a dangerous level. Other potential uses of satellite technology involve looking for surges in infrared (IR) radiation. Such surges indicate thermal anomalies, changes in ground temperature, that have been detected before earthquakes. Also, there appear to be fluctuations in the earth's magnetic field in the area of earthquakes that are about to happen. Both of these phenomena are potentially detectable using statellite-based sensors of sufficient sophistication. Of the three—tectonic motion, IR surges, and magnetic fluctuation—the first seems to be the most reliable, at least so far.